We publish the Bulletin, free to members. Otherwise to purchase a print copy of any Bulletin, contact : The Bulletin Editor. The Geological Society of Norfolk exists to promote the study and understanding of geology, particularly in East Anglia. 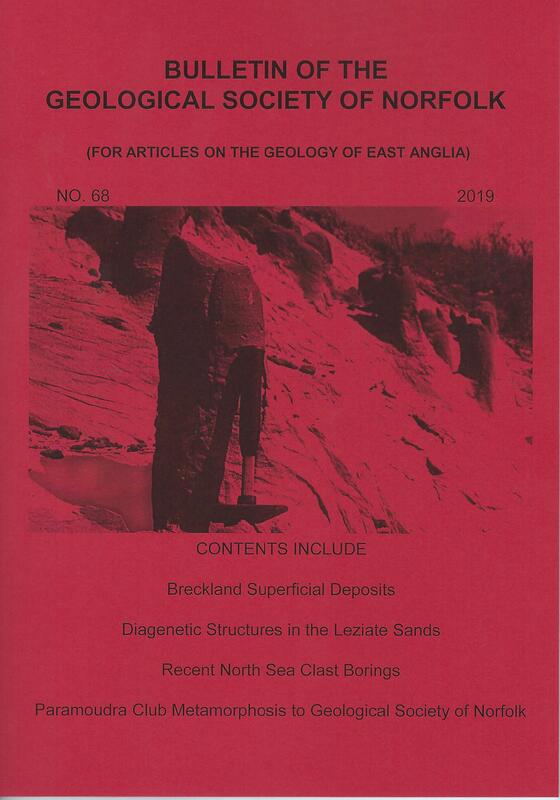 The Bulletin appears yearly and publishes original research papers, notes, discussions or comments, and review articles relevant to the geology of East Anglia as a whole, and does not restrict consideration to articles covering Norfolk alone. All papers are independently refereed by at least one reviewer. Copies of the current Bulletin and back issues may be obtained from the Bulletin editor; the current issue is free to members. Volumes 1-10 and 11-18 are only available as reprint volumes 38A and 39A. Contributors should submit manuscripts as word processor hard copy. We accept typewritten copy and will consider legible handwritten material for short articles only. When papers are accepted for publication we will request an electronic version. We can handle most word processing formats although MS Word is preferred. that used in Vol. 53 of the Bulletin. Titles and first order headings should be capitalised, centred and in bold print. Second order headings should be centred, bold and lower case. Text should be 1½ line spaced. All measurements should be given in metric units. References should be arranged alphabetically in the following style. Anglia. Modern Geology, 9, 221 239. Island (2nd ed. ), 12 66, Heffer, Cambridge.